Want to make fast work of cleaning up leaves and debris in your yard? 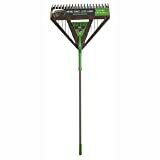 Obviously, so check out this cool new Ames Dual Tine Poly Leaf Rake. 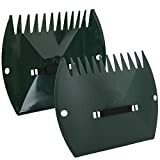 This big 26" wide rake has unique dual tines at the end allowing it to rake up to 45% faster than traditional leaf rakes with less clogging. 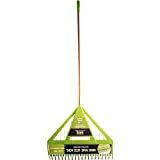 It features a comfort grip handle and includes a built-in detachable hand rake for clearing under bushes and other small jobs. Check out this video to see it in action.